The rain held out, and the weather was great for event #2 held May, 3. There were a lot of cars, but everyone ended up with three timed runs and one "fun run." The 'ol Yaris did pretty well, although on parts of the course, I couldn't decide whether it was better to leave it in 1st gear and hit the rev limiter, or if I should put it into 2nd and not have a whole lot of power. 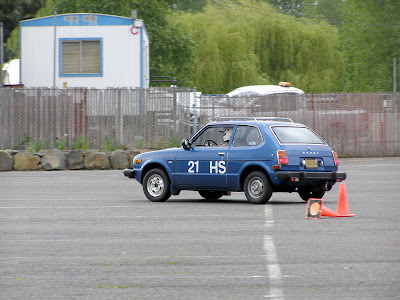 Anyway, there were a few other subcompacts that participated including a couple of MINI Coopers, a 1979 Civic CVCC, and an EP-classed VW Rabbit. Check out the videos below, including the supercharged Mazda Miata, which is a monster. Unfortunately, the way the track is setup, you can really only capture the first half of the track, as the second half goes behind a building. And if you were wondering what the noise in the background was, there was an Oregon Motorcycle Road Racing Association (OMRRA) race on the road course. 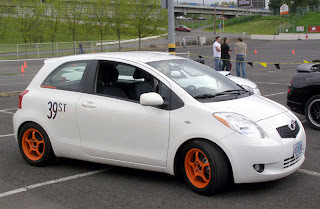 Anyway, that Yaris of yours is pretty sharp, the orange wheels look real nice against the white paint. Thanks for the compliment on the Yaris; I really love it. I wish mine cornered that flat!